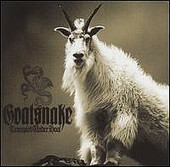 The smooth stoner groove of GOATSNAKE gets dirtier and grittier on this MCD, the first release from the band in fur years. It's doom with warts. It's doom with ragged edges and poison dripping thorns. Heavy as hell's own brimstone, "Trampled Under Hoof" boasts three new tunez and two covers; a SAINT VITUS one and BLACK OAK ARKANSAS, yes, BLACK OAK ARKANSAS song - it doesn't get much better than that. In fact, this CD is to stoner doom what Jim Dandy was to David Lee Roth - that would be "damn near everything." Goatsnake: Trampled Under Hoof Gob/Agoraphobic Nosebleed: Split 7"